Ryan Bouricius used the college's 3D printers to make a functional prosthetic hand. 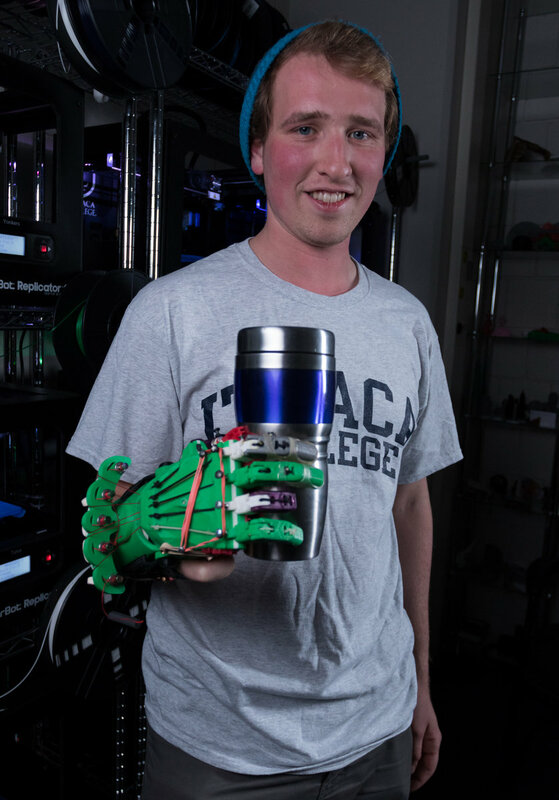 Bouricius, who as a teaching assistant helps run the Ithaca College 3D Printing Lab, became interested in building prostheses after coming across a YouTube video of someone printing and assembling prosthetic hands for little cost. He instantly became interested. After doing some research, he found free designs online, printed out the pieces and assembled a hand in one day. Ever since, he has been working on the prosthetic and figuring out ways it can be improved. Rogers and Bouricius are currently working on a collaboration with the Department of Occupational Therapy in the School of Health Sciences and Human Performance, whose faculty have expertise and experience working with prostheses. Once eNABLE finds a recipient for the hand, occupational therapy faculty and students will assist Rogers and Bouricius with final adaptations to the hand in order to help the recipient get the perfect fit for long-term wear.